This recipe is one of our Thai favourites, mostly for its deliciously smooth coconut milk and red curry sauce with a kick. The meatballs themselves are simple yet delicious, made with a classical combination of Southeast Asian ingredients. Cook the meatballs on a hot pan until they are on the verge of golden brown and then finishing them in the curry together with a delicious serve of local pak choy. Enjoy! Wash the fresh produce. Peel and mince garlic and ginger. Thinly slice the spring onion, separating the white bottoms and green tops. Cut off and discard the root ends of the pak choy; separate the leaves. Trim broccolini (discard ends) and cut in half. Pick the coriander leaves off the stems, keeping them separate; mince the stems. In a medium pan, heat olive oil on medium until hot. Add the white parts of the spring onion, lemongrass, coriander stems, half the garlic and half the ginger. Cook, stirring occasionally, 2 to 3 minutes, or until softened and fragrant. Transfer to a plate and spread into a single, even layer to cool slightly. Wipe out the pan. In a large bowl, combine the chicken mince and cooled aromatics; season with salt and pepper. Mix gently to combine. Using your hands, form the mixture into about 8-12 equal sized balls. In the same pan used to cook the aromatics, heat olive oil on medium-high until hot. Add the meatballs; cook, stirring occasionally, 5 - 6 minutes, or until browned. Transfer to a plate, leaving any drippings in the pan. Heat a medium pot of salted water to boiling on high. Heat the pan of reserved drippings on medium until hot. Add the remaining garlic and ginger; cook, stirring frequently, 30 seconds to 1 minute, or until fragrant. Add as much of the curry paste as you’d like (it is quite hot, so add to taste); cook, stirring frequently. Add ¾ tin of coconut milk; cook, stirring occasionally, 30 seconds to 1 minute, or until slightly reduced. Add the meatballs, pak choy and broccolini; season with salt and pepper. Cook, stirring occasionally, 5 to 7 minutes, or until the meatballs are cooked through. Remove from heat. While the meatballs finish cooking; add the rice noodles to the pot of boiling water. Cook 4 to 6 minutes, or until tender; drain thoroughly. 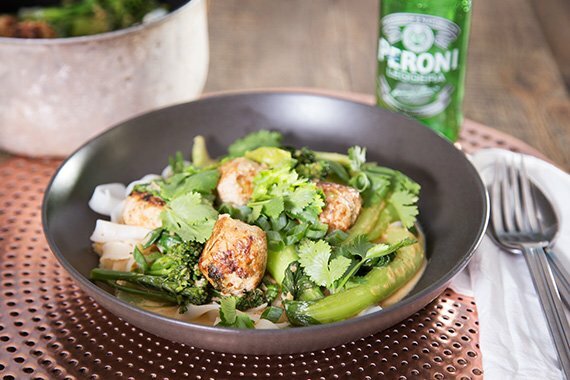 To plate your dish, divide the cooked noodles and coconut curry and meatballs between dishes. Garnish with the coriander and green parts of the spring onion. Enjoy!